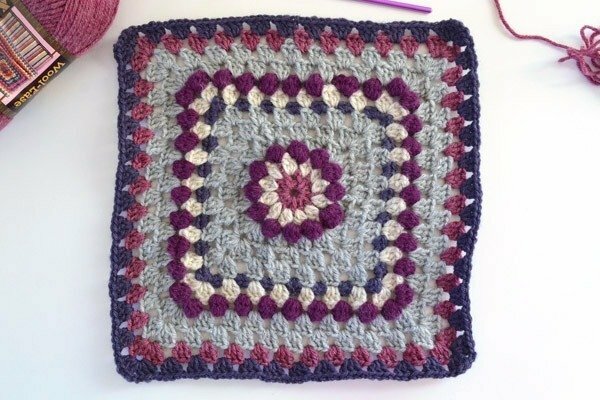 I love granny squares so much! 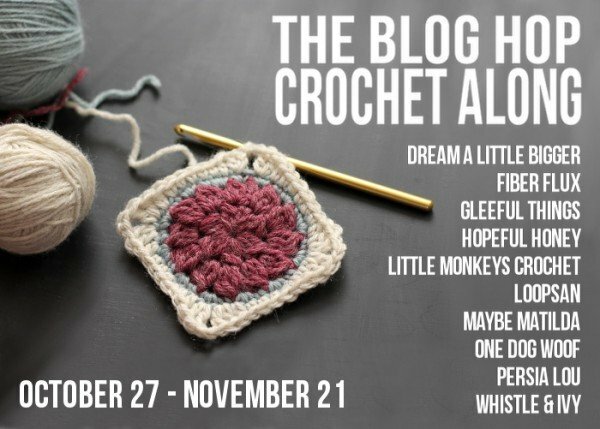 They’re fun to make and they can make you feel crazy productive! 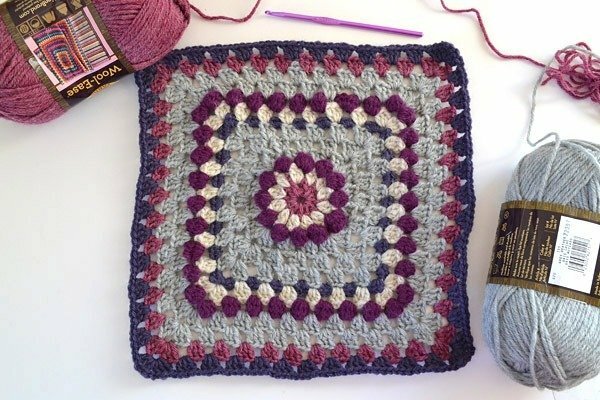 It’s one thing to crochet a gigantic afghan, and totally another to afghan 10 squares and then join them together – it seems so much quicker for some reason! Round 1: Chain 3. Double crochet 11 into ring. At the top of the chain 3, join with slip stitch to close. Round 2: New color. Chain 3 and double crochet 1 time in first gap from DC before. Work 2 double crochet into each DC from previous round and chain 1. Join with slip stitch at top of chain 3. Round 3: New color. Chain 3. Work bobble stitch and then a chain 1 into every other DC from previous round. Join with slip stitch at top of chain 3. Round 4: New color. Chain 3. 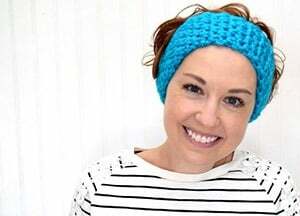 * Work 3 double crochet in between first and second bobbles. Work 3 double crochet in between bobbles, chain 3 3 double crochet (will form corner). Repeat * 3 times. Round 5 & 6: Chain 3. Work 2 double crochet into gap of DC of round before and chain one. Double crochet 3 times through remaining DC from round before and chain 1 to continue through side. At corner, double crochet 3 times, chain 3, then double crochet three times. Continue around. Round 7: New color. Chain 2. Work 2 single crochet into gaps of DC of round before and chain 1. Single crochet 3 times through remaining DC from round before and chain 1 and continue through side. At corner, single crochet 3 times, chain 2, then single crochet three times and chain 1. Continue around. Round 8: Second color. Chain 3. Work 2 double crochet into gaps of SC of round before. Double crochet 3 times through remaining SC from round before and chain 1 and continue through side. At corner, double crochet 3 times, chain 3, then double crochet three times. Continue around. Round 9: Third color. Chain 3. Bobble crochet into gaps of DC from round before. At corners bobble, chain 3 bobble. Continue around. Round 10 & 11: Fourth color. Work 2 double crochet into gaps of DC of round before. Double crochet 3 times through remaining DC from round before and chain 1 and continue through side. At corner, double crochet 3 times, chain 3, then double crochet three times. Continue around. Round 12: First color. Work 2 double crochet into gaps of DC of round before. Double crochet 3 times through remaining DC from round before and chain 1 and continue through side. At corner, double crochet 3 times, chain 3, then double crochet three times. Continue around. Round 13: Fifth color. Work 2 double crochet into gaps of DC of round before. Double crochet 3 times through remaining DC from round before and chain 1 and continue through side. At corner, double crochet 3 times, chain 3, then double crochet three times. Continue around. Quick Question- I think this is a great idea. Which blogs have done a square already? I am trying to catch up. Hi Allison, In round four. 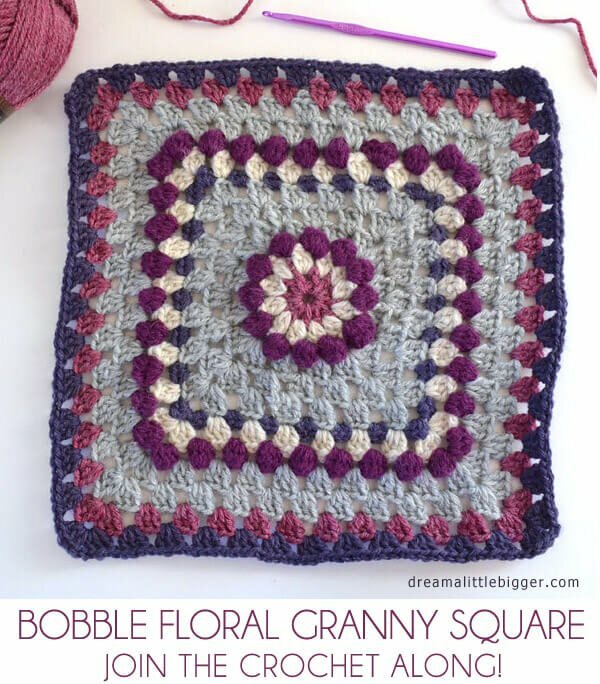 when you form the corner, where do you put the 3 double crochet? Hi, Julie. At the corner you’ll do three double crochets, chain 3 and then three more double crochets in the same gap. Does that help?